Wounded Times: Trump Appointee Thinks PTSD Vets are Faking! Trump Appointee Thinks PTSD Vets are Faking! From CNN aside from the other sickening things he had to say, which are too many to list here, this is more of the above report from CNN, with audio, if you can stand to hear the words out of his mouth. Reading them were bad enough, but listening to him was even worse. 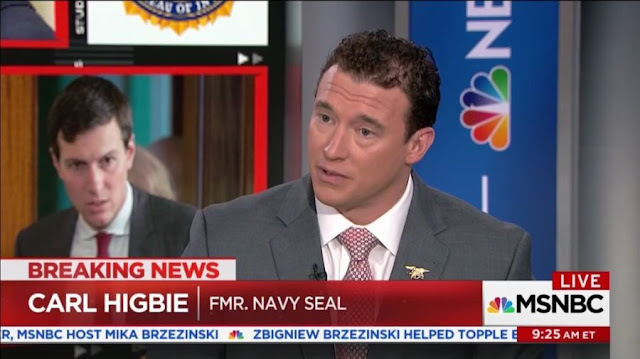 "Yeah I'm a gonna go out on limb here and say, a lot of people are going to disagree with this comment," Higbie said on Sound of Freedom in February 2013. "But severe PTSD, where guys are bugging out and doing violent acts, is a trait of a weak mind. Now things like (military member) Brandon, where he was legitimately blown up and a loud noise makes him on edge -- completely understandable, but when someone performs an act of violence that is a, it is a weak mind. That is a crazy person, and the fact that they're trying to hide it behind PTSD makes me want to vomit. ""I'd say 75% of people with PTSD don't actually have it, and they're either milking something for a little extra money in disability or they're just, they honestly are just lying," Higbie said in August 2014, as a guest on an Internet radio show. "Twenty-five percent legitimately do have problems. They have bad dreams. They can't cope. They have problems with noises and things like that. And I really think there are people that cannot deal with the stress of combat and some people can." Guess he didn't know the number changed...the reported number anyway. VA Conducts Nation’s Largest Analysis of Veteran Suicide July 7, 2016, 09:56:00 AM WASHINGTON — The Department of Veterans Affairs (VA) has undertaken the most comprehensive analysis of Veteran suicide rates in the U.S., examining over 55 million Veteran records from 1979 to 2014 from every state in the nation. The effort extends VA’s knowledge from the previous report issued from 2012, which examined three million Veteran records from 20 states were available. Based on the 2012 data, VA estimated the number of Veteran deaths by suicide averaged 22 per day. The current analysis indicates that in 2014, an average of 20 Veterans a day died from suicide. Considering there are Medal of Honor Heroes, other Generals, Navy SEAL, Green Berets, Special Forces from all generations, saying they have PTSD...doubtful any of these men would be willing to look one of them in the eye and tell them they were not tough enough to take it!